James Spann has the forecast for a rainy Tuesday in Alabama from Alabama NewsCenter on Vimeo. WET: A deep upper trough and surface cold front is pushing a band of rain into Alabama this morning. Rain will overspread the state in coming hours; most communities will have potential for one-half to three-quarters of an inch today. 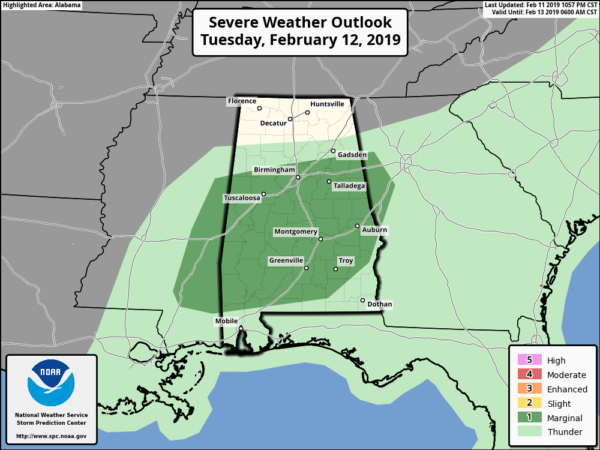 The Storm Prediction Center has reintroduced a marginal risk (level 1 out of 5) of severe thunderstorms for central and south Alabama; the main threat will come from strong, gusty winds. There is very little surface-based instability, which will keep the overall threat low. Temperatures have been rising overnight, and we are seeing mostly mid 60s across the state at daybreak. We fall back into the 50s this afternoon as rain ends from west to east and cooler air returns. The sky will clear tonight. WEDNESDAY THROUGH FRIDAY: Wednesday will be a bright, sunny day. We start the day in the 30- to 35-degree range, followed by a high in the upper 50s. Thursday will be dry as well; the sky will be partly sunny with a high in the mid 60s. Clouds increase Thursday night, and Friday will be a mostly cloudy day with a chance of showers. The latest model trends have backed off on the amount of rain with this feature at the end of the week, and it looks like it won’t rain all day. The weather will stay mild, with a high in the 60s Friday afternoon. THE ALABAMA WEEKEND: We will need to make some significant changes to the weekend forecast. The surface front on Friday initially looked like it would surge southward into the northern Gulf, giving us a cool, dry weekend. That idea is off the table; it looks like the front will hang up and stall over central Alabama Friday night, which means clouds will linger into the weekend with some rain at times. Saturday now looks cloudy and mild with showers possible; it won’t rain all day, and temperatures will be pleasant, with a high in the 60s. A wave of low pressure moves along the stalled front, and Sunday looks cloudy with rain becoming more widespread; the high will be in the 67- to 71-degree range as mild air continues to cover the Deep South. NEXT WEEK: Unsettled weather continues for the first half of the week. Some rain is possible Monday, and rain should become more widespread Monday night into Tuesday with another wave moving along the nearly stationary front. The latter half of the week will trend drier. 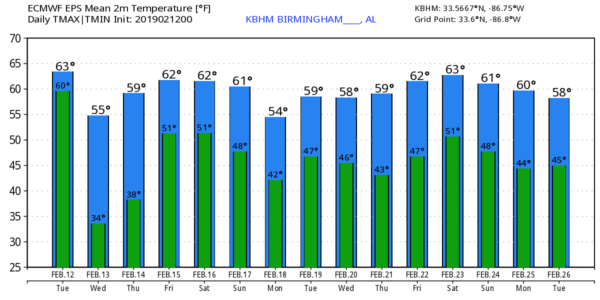 For now, there’s still no sign of any extremely cold air for Alabama over the next seven to 10 days. ON THIS DATE IN 1958: Snow blanketed northern Florida, with Tallahassee reporting a record 2.8 inches. A ship in the Gulf of Mexico, 25 miles south of Fort Morgan, reported zero visibility in heavy snow on the afternoon of Feb. 12.